Through a partnership with the Chattahoochee Nature Center, Georgia public libraries have day passes to CNC available for checkout. The pass is good for four people to get free general admission to CNC’s 127 acre site in Roswell. With their free admission, pass holders gain all-day admission to CNC to enjoy picnicking, hiking trails, family fun days, aviaries with wild birds, concerts, and plenty of activities for all ages. CNC is open seven days a week, year-round. During summer months, CNC’s popular Butterfly Encounter is open every day, allowing guests to walk among hundreds of butterflies. For more about the Chattahoochee Nature Center, its daily programs, and special events, visit www.chattnaturecenter.org. Thanks to a partnership with the Georgia Public Library Service, the Georgia Aquarium offers free or discounted admission to the aquarium for library patrons through two great programs. Go to any Georgia Aquarium ticket window and show proof of your birthday with either a valid ID or a copy of your birth certificate, and you will receive free general admission to the aquarium. Purchase discounted admission tickets, annual memberships, and special experiences from the aquarium’s library program page. Follow the instructions near the bottom of the page to create an account and purchase your tickets online in advance of your visit to the aquarium. Birthday tickets must be redeemed and used on the day of your birthday, with no exceptions and no refunds for previously purchased tickets. This offer is valid for Georgia residents only. All programs are administered by the Georgia Aquarium and are subject to change. Visit the aquarium’s Greater Atlanta Libraries page for full terms and conditions. Georgia State Parks’ ParkPass and Historic Sites Pass are available for checkout at your local library! The ParkPass exempts visitors from paying the daily $5 parking fee at state parks. The Historic Sites Pass exempts up to 4 visitors from admission fees to state historic sites. You can also check out a State Parks Discovery Backpack to take on your trip. Each backpack kit comes with a sturdy, five-pocket backpack containing a pair of 5×30 binoculars, a guide to Georgia’s state parks and historic sites and foldout pocket naturalist guides to Georgia wildlife, birds, trees and wildflowers. Park and Historic Sites Passes check out for 7 days with one renewal. Overdue fines are $3.00 per day, and the replacement cost is $100.00. State Parks Backpacks check out for seven days with one renewal. Overdue fines are $3.00 fine per day, and the replacement cost is $75.00. Visit the Georgia State Parks’ Things to Know page for full terms and conditions. With the Michael C. Carlos Museum’s Family Pass, Georgia families can now enjoy the museum’s exquisite permanent collections and renowned special exhibitions for free! Individuals and families with a valid Georgia library card can check out a Family Pass to the Carlos Museum at more than 400 participating libraries across all 159 Georgia counties. Checks out for seven days with one renewal. Overdue fines are $3.00 per day, and the replacement cost is $50.00. Valid for up to 6 museum admissions. 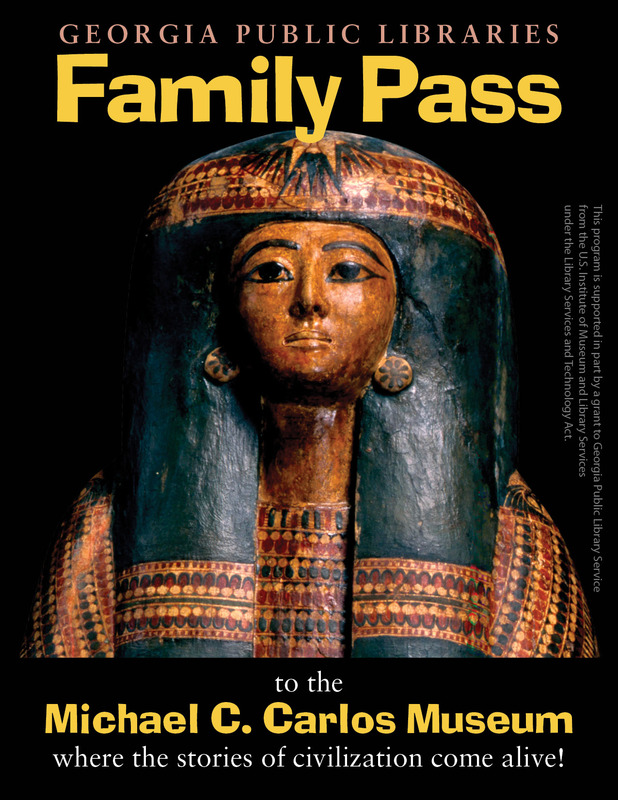 Visit the museum’s Family Pass Program page for for full terms and conditions. Check out the Georgia Public Libraries’ Passport to Puppetry at any participating public library in Georgia for free museum admissions and special show and workshop discounts for your family! 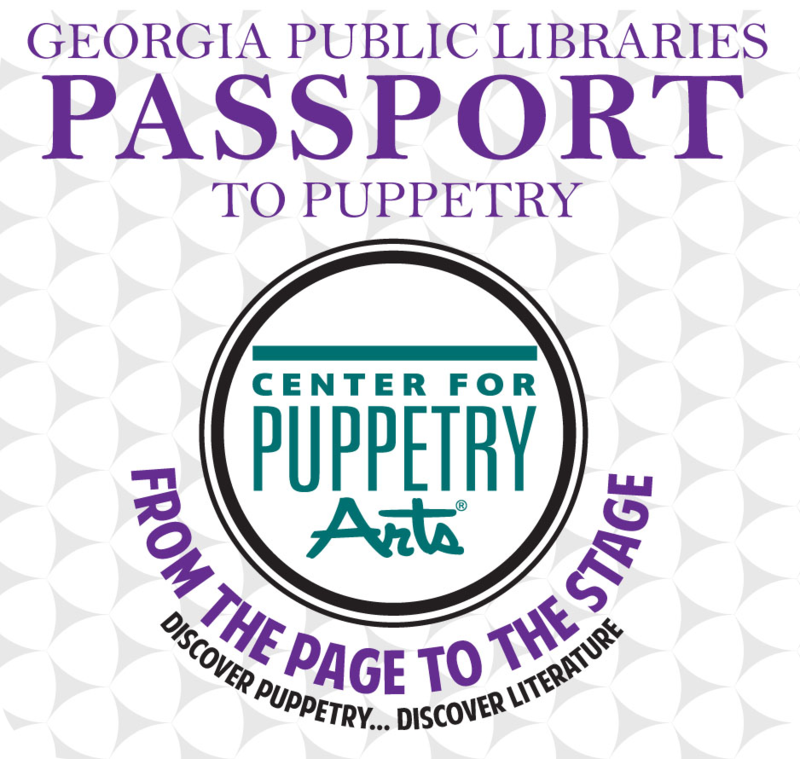 Thanks to a partnership between the Center for Puppetry Arts and Georgia Public Library Service, citizens with valid library cards can check out the Center’s new “Passport to Puppetry” at any participating public library in all 159 Georgia counties. Valid for up to 4 Museum admissions. Receive 25% Off of an All-Inclusive ticket, which includes a Family Series Performance, a Create-A-Puppet Workshop, and the Museum! All-Inclusive ticket discount must be redeemed day of Museum visit. Visit the Passport to Puppetry page for full terms and conditions. Adults with a valid library card from any participating Georgia public library system may access Zoo Atlanta’s Library Pass. Come watch the DVD at the library or check out a copy to take home! Checks out for seven days. Overdue fines are $3.00 per day, and the replacement cost is $30.00. Valid for up to four guests. Standard general admission will apply to families larger than four. You will need to present the Zoo Pass form and your library card at the Zoo Atlanta front gate in order to redeem the free admissions. Pass is redeemable Monday through Friday only, including holidays and school breaks. Pass is valid for 28 days (4 weeks) from the date of the form showing the return of the DVD. You can redeem one pass per year, per household. Read the Zoo Pass FAQ. Visit the zoo’s Library Pass Program page for full terms and conditions.